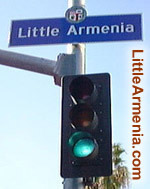 LittleArmenia.com is a community-based website promoting cultural awareness and community participation by showcasing businesses, services, activities, and opportunities in Little Armenia (Hollywood, California). The traditional birthplace of the Armenian community in the City of Los Angeles, Little Armenia is a small, yet growing community in East Hollywood. The name "Little Armenia" was officially designated by the City in October 2000, to reflect the large Armenian population and hundreds of highly visible Armenian businesses within this area. You can find just about anything Armenian here, from churches and restaurants, to auto mechanics and doctors. Little Armenia boasts not only a thriving Armenian community, but is also home to many other ethnic groups. A small area known as "Thai Town" in Little Armenia hosts a vibrant Thai community. Here you can sample exceptional Thai cuisine at several restaurants or purchase exotic products at various Thai markets. There is also a large, active Latino community in Little Armenia. You don't have to go far to find restaurants serving great tasting Mexican and Central American food, or a salsa night club to dance the night away. Come visit Little Armenia in Hollywood to experience the most ethnically diverse community in the City of Los Angeles.